You can change your User ID on our website or via digibank Online. Enter your credentials (eg. NRIC, ATM/Debit Card Number & Card PIN). Click on Change, and enter your desired new digibank User ID. Log in to digibank Online with your existing digibank User ID and PIN. 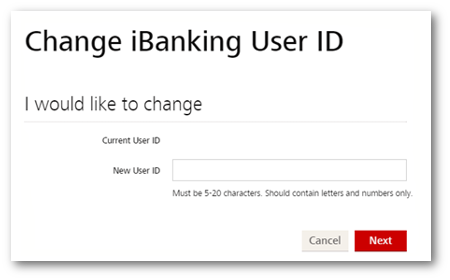 On the Top Menu, under Preferences, click on Change iBanking User ID. Authenticate your access using your DBS iB Secure Device / SMS One-Time Password (OTP). Input your New User ID (Must be 5-20 characters, contains letters and numbers only). Click Next to submit the change.